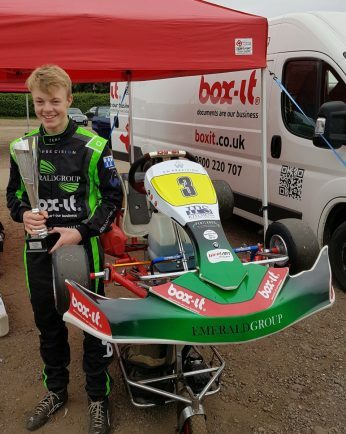 KARTING star Harry Graham picked up three wins out of three in the latest round of the BirelArtUK Series at Whilton Mill in Northamptonshire. The 15-year-old North Leamington School pupil qualified in second and in the heat race he overtook rival Scott Huntley with three laps left to claim the win. In the pre-final there was another win for Graham and was once again closely followed by Huntley in second. Then in the main final Graham got off to a good start and along with Huntley they pulled away from the rest of the pack. With eight laps left the pair were side by side going into Christmas Corner but Graham managed to get a good exit to retain first place. Graham and Huntley had more side by side moments but on every occasion the former held firm to stay in front before eventually taking the race victory.